2017 Nobel Peace Prize Awarded To International Campaign To Abolish Nuclear Weapons : The Two-Way The prize was announced in Oslo, Norway, on Friday morning. The campaign, known as ICAN, seeks an international legal prohibition on nuclear weapons. 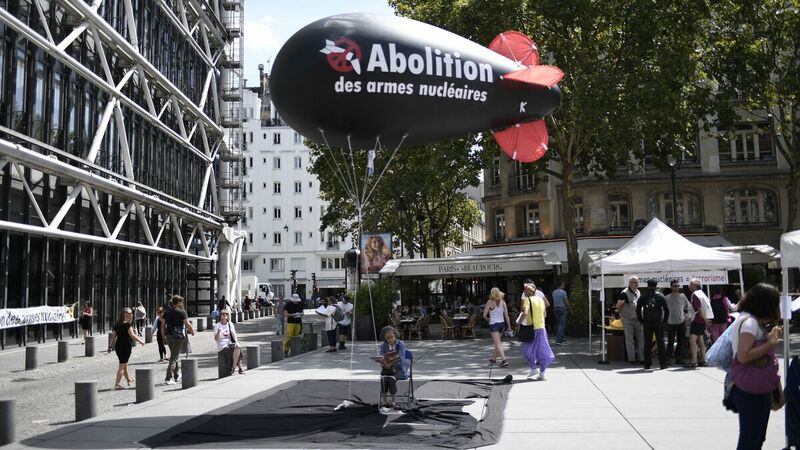 A woman sits underneath a balloon, carrying the logo of the International Campaign to Abolish Nuclear Weapons, in Paris on August 7, 2017. Activists were holding a four-day hunger strike calling for France to sign the ICAN-supported treaty to ban nuclear weapons. The group has now won the Nobel Peace Prize. The 2017 Nobel Peace Prize has been awarded to the International Campaign to Abolish Nuclear Weapons, or ICAN, a global organization seeking to "outlaw and eliminate all nuclear weapons" under international law. The prize was announced in Oslo, Norway, on Friday morning. The committee praised ICAN for drawing attention to "the catastrophic humanitarian consequences of any use of nuclear weapons" and for "ground-breaking efforts" to ratify a treaty banning nuclear weapons. Specifically, ICAN promotes the U.N.'s Treaty on the Prohibition of Nuclear Weapons, a legally binding prohibition on nuclear weapons that is supported by over 100 countries. The world's nuclear powers have not committed to the treaty. The Norwegian Nobel Committee noted that any actual nuclear disarmament will depend on the participation of nuclear states, but praised ICAN's "inspiring and innovative support" for international negotiations. The committee noted the peril that more countries will attempt to acquire nuclear weapons, "as exemplified North Korea." And the prize-winning organization highlighted growing international tension, writing on Facebook that "fiery rhetoric could all too easily lead us, inexorably, to unspeakable horror." "The spectre of nuclear conflict looms large once more," the group wrote. "If ever there were a moment for nations to declare their unequivocal opposition to nuclear weapons, that moment is now." Berit Reiss-Andersen, Chair of the Norwegian Nobel Committee, objected to the idea that the prize was "symbolic" because states possessing nuclear weapons don't support ICAN's treaty banning them. "I do believe that law matters," she said. She said the prize represents "encouragement" to nuclear powers to continue negotiations. She noted that many powers have committed to a nonproliferation treaty, albeit not the ban treaty, and therefore "have already have committed to themselves to the goal of a nuclear-free world." "We are not kicking anybody's leg with the prize," she said. "We are giving encouragement." In a statement on Facebook, ICAN called the prize "a tribute to the tireless efforts of many millions of campaigners and concerned citizens worldwide who, ever since the dawn of the atomic age, have loudly protested nuclear weapons, insisting that they can serve no legitimate purpose and must be forever banished from the face of our earth." Reiss-Andersen acknowledged there are many organizations pursuing the goal of nuclear disarmament. "We have focused on ICAN because we feel, the Norwegian Nobel Committee, that they have taken the leading role in revitalizing this process," she said. She also said they combine grassroots engagement with the legal and political process "in an admirable matter." Nuclear disarmament was established by a goal in the United Nations' first-ever resolution, the Norwegian Nobel Committee notes. ICAN has given the cause "a new direction and new vigor," the committee writes. Advancing disarmament and arms control is one of the central criteria for awarding the Peace Prize, along with the promotion of peace talks and the "promotion of fraternity between nations." Several previous Peace Prizes have focused on nuclear disarmament. In 1985, the prize was awarded to the International Physicians for the Prevention of Nuclear War, and in 2005, it was granted to International Atomic Energy Agency (IAEA) for promoting peaceful uses of nuclear energy. More than half a dozen individuals have also been awarded, at least in part, for their work on nonproliferation or disarmament. This year's Nobel Peace Prize, which was awarded to ICAN as an entire organization, comes with 9 million Swedish krona in cash, or around $1.1 million. Last year's Peace Prize went to Juan Manuel Santos, the president of Colombia. The decision surprised many; peace talks in Colombia were not concluded, and it's rare for the committee to award a prize to only one half of a peace negotiation. The Peace Prize is the fifth Nobel prize that was established in Alfred Nobel's will, and the only one awarded by the Norwegian Nobel Committee. This year's Nobel Prizes in Medicine, Physics, Chemistry and Literature were announced earlier this week in Sweden. The Nobel Memorial Prize in Economics, which was established in 1969, will be announced on Monday. A previous version of this post said the Nobel Peace Prize was announced on Monday. Today is, in fact, Friday. A previous version also incorrectly referred to Alfred Nobel as Arthur.